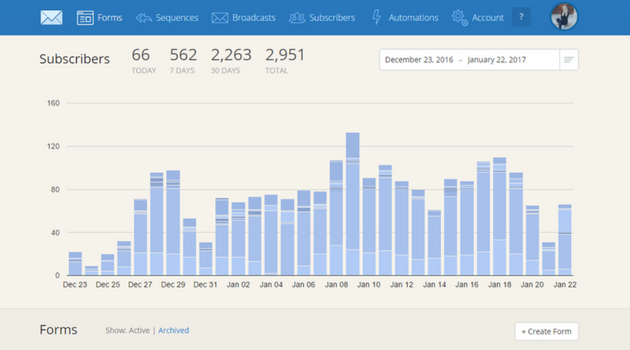 When I signed up with Convertkit in November 2016, my email list had 366 subscribers. Now, just two months later, my email list is just shy of 3,000. That’s over a 700% increase in subscribers! Despite blogging for almost three years now, it took me two years before I started my email list. TWO YEARS! Don’t make the same mistake I did please. Below shows my subscriber growth for the last 30 days. 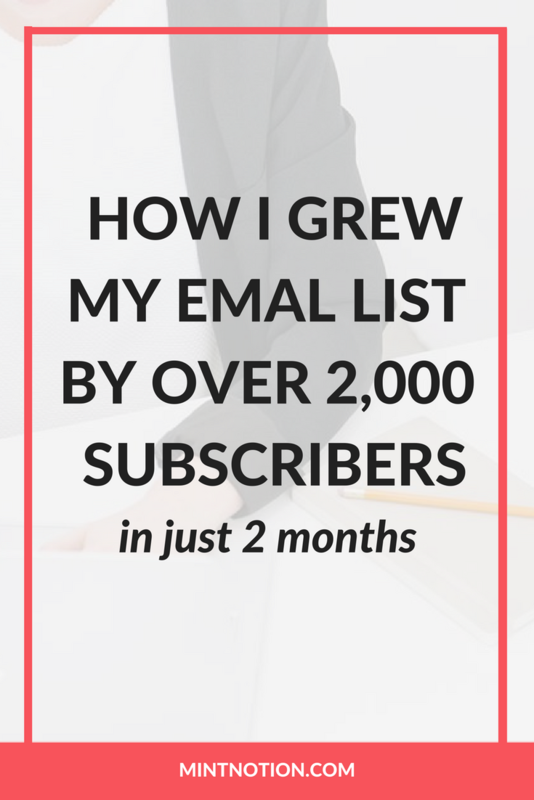 I started my email list last spring using Mailchimp because it was free for up to 2,000 subscribers. As someone who likes to blog on a budget, Mailchimp seemed like the obvious choice since it was free and I really didn’t understand the value of having an email list. Honestly, it was frustrating because my blog page views were growing, but my email subscribers weren’t increasing. And that was a problem. What’s the point of increasing your page views if you aren’t turning those viewers into subscribers? Yes, it’s nice when your readers turn into social media fans, but you really want them on your email list. Why? Because aside from your website, your email list is the only thing you have control over. Social media platforms are constantly changing their algorithms, which makes it harder to reach your audience. So if you spent a long time growing your audience on Instagram (like I did in the beginning) and they decide to change their algorithm (again) so that only five people ever see your posts, you’ll still have an email list full of loyal and dedicated readers who are excited to open your emails and listen to what you have to say. Thank goodness you have control over your email list! Plus, email subscribers are more likely to be product buyers, which means that if you ever decide to sell a product or service on your website, you absolutely need an email list. So now that I understood the value of having an email list, I turned to Pinterest to search for tips to help my grow my list and figure out what I was missing. After reading several helpful blog posts, I realized that the key to growing your email list was content upgrades. Content upgrades? What does that even mean?! (This was my exact thought). A content upgrade is a free bonus that you offer inside of a blog post to your readers. It’s unique because every content upgrade you create is tailored to a specific blog post. This freebie essentially upgrades the reader’s experience by sharing a bonus offer that complements the post that you’ve written. But that sounds like A LOT of work! It already takes me 2-5 hours to write one blog post and now I have to create a content upgrade on top of that? (These were my initial thoughts on content upgrades). Creating a new content upgrade for each new blog post is not necessary if you want to grow your email list. While it can certainly help and your readers might appreciate your content upgrades, I recommend testing the waters with a general free bonus offer first. What does your target reader NEED right at that moment when they are reading your blog post? What do they wish they had while they are reading your blog post? And there you have it – the perfect content upgrade that your readers will love! For example, some of my most popular posts on Mint Notion are posts about saving money. I often talk about tracking your expenses, setting goals, and using a budget planner to organize your finances. Many people get into debt or live above their means because they don’t have a budget. That’s why I created a FREE budget planner printable to help my reader organize their finances. Convertkit makes it super easy to create different email opt-in forms to insert into your blog posts, at the bottom of your posts, and/ or in your side bar. When using Convertkit’s WordPress plugin, you literally just need to select the email opt-in form you want to appear from drop down menu in your post editor. You can create as many email opt-in forms as you wish, which makes it super easy to offer a variety of different content upgrades or even a simple newsletter sign up form. For each form you create, Convertkit shows you how many people have visited your form, how many subscribers signed up through that particular form, and your conversion rate. This is super helpful in understanding how well a form is doing to grow your email list and whether it needs tweaking to increase your conversion rate. 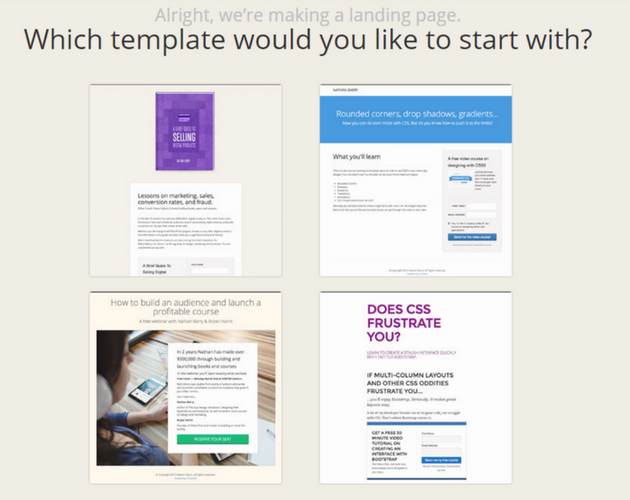 Convertkit also offers landing pages which are free standing pages hosted on Convertkit. Landing pages can be an effective tool to capture email addresses. It’s meant to act as a high-converting opt-in and sales page to persuade your reader to sign up or buy your product. At this current time, I don’t have any products to sell, but I have created a landing page to highlight two of my most popular freebies: My free blogging course and my Budget Binder. These landing pages have a higher conversion rate than my regular forms, which is why I love using this feature in Convertkit. One of the main reasons I was initially drawn to Convertkit, was their Sequence feature. I was planning on creating my first freebie for my readers (a free email mini-course) and I read horror stories about using Mailchimp for this. I have nothing against Mailchimp, but I have heard from other bloggers that Mailchimp is not very reliable for running email courses. Once I had the content written for my email mini-course, I signed up with Convertkit and was determined to make the most out of it. After entering my payment information, I was nervous, but also very excited to get started with Convertkit. This was the first email marketing service I’ve paid for and I really wanted to see how I could use it to grow my email subscribers. While I had high hopes, my previous email list growth with Mailchimp made me think that email marketing was not for me. But then something incredible happened, I started gaining email subscribers and it felt good! First it was with my free mini-course, then I started creating a few more freebies for my readers. And that’s when my email list exploded! I started to receive hundreds of emails from new subscribers which helped me to build a better relationship with my readers. It gave me insight into what their goals are, what they are currently struggling with, and how I can create content going forward to help them. Sequences are a great way to create and automate email courses, welcome emails, sales funnels, and more. It’s perfect for bloggers looking to start building relationships with their subscribers from the moment they join their list. That’s why I love sequences and I am currently in the process of creating another free mini-course for my readers! The key is to treat your email list like a friendship. I know my readers are special and I respect their inbox. I only send out emails when I have something useful to share or I stumble upon a great product or service that I know they will love. Convertkit automations are the best thing since sliced bread. This is the glue that holds your workflow together. For example, you can trigger an action when a product is purchased, when someone subscribes to a new form, or when a course is completed. 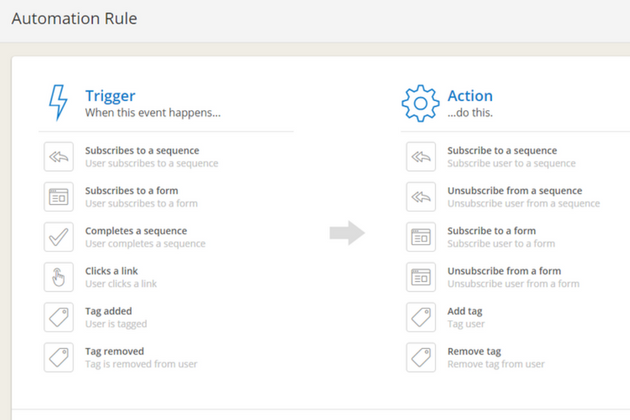 For example, I can create a rule that tags my subscriber when they sign up for my blogging course. This lets me know that that subscriber is interested in blogging and I can send them helpful emails going forward that are tailored to this topic. Convertkit even offers automation blueprints to help you get started on some common marketing automations. This may include a product pitch, and automated launch, webinars, and more. Convertkit easily integrates with a number of services, such as e-commerce and payment portals, lead captures, membership and course websites, webinar services and more. Some of these services include Gumroad, LeadPages, Teachable, Webinar Jam, WordPress, and more. Include or exclude certain subscribers from your emails. When sending a broadcast email to your subscribers, you may not want to send this email to everyone on your subscriber list. For example, if you are sending an email with a sales offer, you don’t want to send it to someone who has already purchased your product. Convertkit makes it easy to include or exclude certain subscribers from your emails. 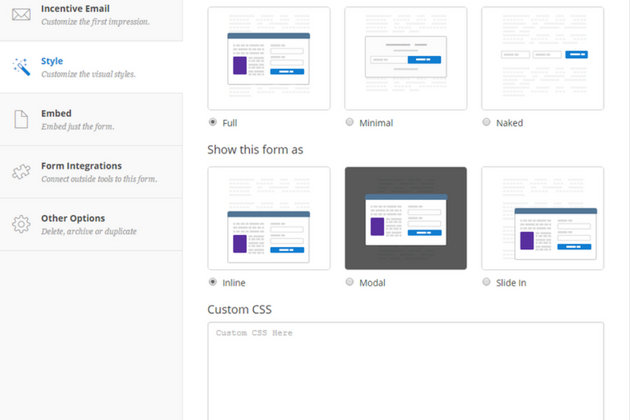 Multiple form options and custom CSS. If you don’t like the look of the default form on Convertkit, you can easily customize it by adding CSS. You can also change the style of your form with a single click and make your form inline, modal, slide in, or a pop-up. If you’re serious about blogging (or working towards that goal), you need an email list. And the best way to grow your subscribers is to offer them a freebie or content upgrade. After checking out the features available with other email marketing services, I truly believe that Convertkit offers the best value and it comes with all the tools to help you grow your blog and increase your revenue. If I could go back in time and start my blog all over again, the first thing I would do after paying for web hosting and a pretty theme is to invest in Convertkit. Building your email list and marketing to them effectively is the best thing you can do for yourself as a new blogger. Convertkit makes this super easy. It took only a few minutes for me to export my Mailchimp list and import it into Convertkit. (I actually couldn’t believe how easy this process was). While I understand that not everyone is looking to blog professionally, I cannot stress how important it is to build an email list. You never know which direction you might want to take your blog someday. I started my blog as a hobby and now it’s turned into one of the most rewarding side jobs I’ve ever had. Give it a shot! Hey Jen, that’s great progress you’ve made on your blog this month. Having an opt-in available for your audience is a great way to grow your subscribers. Wishing you much success! I just switched from Mail Chimp to Convert Kit today and am so happy to have made the switch! Organizing my subscribers just became a LOT easier! Thanks for reading Tegan! Offering a freebie to your readers is a good way to grow your email list. Convertkit makes it super easy to offer a freebie and creating opt-in forms. Plus Convertkit is subscriber based, so a subscriber can sign up for as many freebies as you offer and they will only be counted once. This is different than Mailchimp. Yes, it took me two years before I even started collecting email addresses (because I didn’t understand why email marketing was so important for bloggers). I spent a lot of time trying to grow my social media platforms in the beginning, such as Instagram. But after the algorithm changed, I saw my engagement levels drop. From what I’ve seen so far, email builds a deeper connection with my audience than social media. Now I focus primarily on email, SEO and Pinterest to help grow my readership. Really great to know about this mailing tool! Thanks for sharing the details! Never heard of this before. I may have to check them out. Email lists have not been something I was focused much on. Hi Eden! Yes, totally worth it. I also switched to ConvertKit from Aweber. So much easier to use!